Add Beauty To Your Spaces with Our Affordable Oil Paintings is Ours! BeyondDream Art (d/b/a of YuKool LLC) is a leading online oil painting art gallery. It was founded in 2004 and is based in Pearland (Metropolitan Houston), Texas, of U.S.A.
People love handmade oil paintings - oil paintings' inherently deep, rich and vibrant colors, with their beautiful brush textures, all make them look far more superior to other medium like prints. Unfortunately, hand-painted oil paintings are often too expensive and are out of reach for ordinary people. On one side, we have lots of unknown starving artists who can paint beautiful paintings but do not know how to market their works, thus are still struggling to make their livings. On the other side, there are many ordinary oil painting lovers who just want affordable and real oil paintings to decorate their spaces, while do not care who paint them, or whether the artists are famous or not. We want to bridge this huge gap. That's why we are here. Since we opened our business, we spent lots of time visiting many artists and studios, whenever we found paintings we liked, we would collect them. Year after year, we have amassed several thousands of different (styles/subjects of) oil paintings. This seemingly blind tactic has gradually built our advantage and becomes our strength: No other galleries have so many different (styles/subjects of) oil paintings in Stock. And, yes, we can ship them within 24 hours, and FREE for US customers! Our US customers usually can receive their paintings in 2~4 business days. We are that good! We are an online gallery and do not need to rent super expensive physical stores, we can pass the saving costs to our customers. We can order large numbers (sometime over hundreds) of artworks from same studios or artists, thus can persuade them to give us competitive prices. We have long-term cooperative relationships with many studios and artists - they can give us favorable prices. Over a decade, we have served tens of thousands of happy customers all over the world: there are homeowners who want to decorate their newly acquired dream homes; doctors, dentists and lawyers who just opened their businesses and need paintings for their offices; real estate investors who want to decorate their vacation rental properties; and restaurant owners who want to decorate their restaurants. We also have TV producers who used our paintings decorating their TV studios. 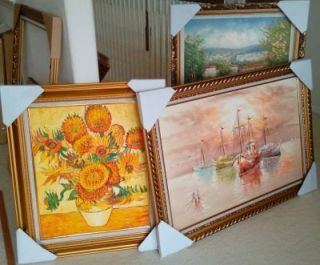 There are also people who bought oil paintings as gifts to their friends or loved ones. You name it - we have so many customers with different backgrounds! We, at BeyondDream Art, feel so proud, honorable and excited that we have the chances to serve so many wonderful people like you. We are also working as a wholesaler to distribute bulk artworks to offices, hotels, furniture stores, and other art galleries. 2014: Happy 10 Year Anniversary, BeyondDream Art! You Are Great!